Ubisoft Entertainment SA's (UBSFY Yves Guillemot is getting to be an expert at fighting off hostile takeovers. Thirteen years ago, Electronic Arts Inc. (EA - Get Report) bought a 20% stake in the France-based video game publisher, a move that Guillemot, who is Ubisoft's co-founder, CEO and chairman, described as "hostile." The two firms faced off for six years before EA sold off its shares. Soon after, Ubisoft began to transform itself from a mid-tier publisher to one of the biggest in the industry (year-to-date, it's responsible for the industry's two best-selling titles —Tom Clancy's "Ghost Recon: Wildlands" and "For Honor"). Two years ago, a new battle began to loom. In October 2015, Vivendi (VIVEF bought increasingly substantial blocks of shares in the company. As of last December, the French media conglomerate held a 25.15% ownership stake in the company behind such iconic titles as "Assassin's Creed" and Tom Clancy's "Rainbow Six Siege." And, in its filing with French financial regulators, Vivendi also said it may continue to buy shares depending on market conditions. In April, Reuters further reported that Vivendi planned to accelerate acquisitions in the video game space this year, with Ubisoft expected to be the first target. Guillemot and Ubisoft, though, have made it clear they're still not interested. 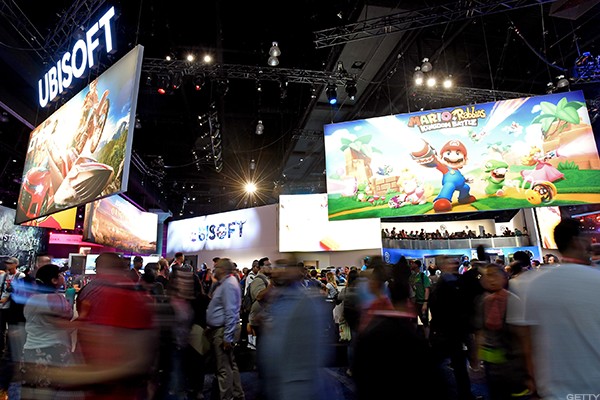 "They didn't announce more this year than last," said Guillemot at the Electronic Entertainment Expo 2017 this week in Los Angeles. "What we feel is they are financial guys. So they're going to look at what's in their best interest. Our best defense has been to perform. And when you perform, you can show your shareholders that it's better for them to stick with the team that's managing the company instead of going to another." Last September at its annual shareholders meeting, Ubisoft won a battle when its nominated board of directors was elected. Vivendi, which previously said it had planned to seek a presence on the board, ultimately did not make any nominations. According to French law, once a buyer owns more than 30% of a company's shares, they must make an attempt to purchase a controlling stake for a reasonable price. Guillemot and his brothers (who together own 9% of shares and hold 16% of the voting rights) have been shoring up shareholder support for the better part of the past year—and offering longer-than usual sales projections. (Ubisoft now projects 2018 fiscal year revenue of roughly €1.7 billion ($1.9 billion), a 16% year-over-year increase, and non-IFRS operating income of roughly €270 million ($304 million), up 14%. For the 2019 fiscal year, it's estimating revenue to be €2.20 billion ($2.5 billion) with non-IFRS operating income of €440 million ($496 million). The company also expanded an employee stock purchase program, raising the employee ownership of the company from 2% to 4% of outstanding shares, presumably increasing the ranks of those who would vote against a takeover. It's a personal battle for the Guillemots, who founded Ubisoft in 1986. Vivendi has already out maneuvered them for control of Gameloft, a mobile game studio, which it acquired via a hostile takeover in 2015. Guillemot last year said the family expected Vivendi to pursue a creeping control strategy with Gameloft, but the company's strategy of escalating the offer per share from €6 to €7.2 to €8 caught them off guard. Should Vivendi succeed in a takeover of Ubisoft, it might gain control of key titles such as "Assassin's Creed" and "Rainbow Six," but the bigger question is: Will the people who make those games stick around? And investors realize that, which is something Ubisoft is counting on. "What we've seen is that our shareholders are very happy with the direction we're taking, so it gives [Vivendi] less space to do a creeping control," says Guillemot. "It's still a risk, but doing a creeping control in a company that is growing and is appreciated by the people who invest in the company is more difficult than a company that is not performing well."